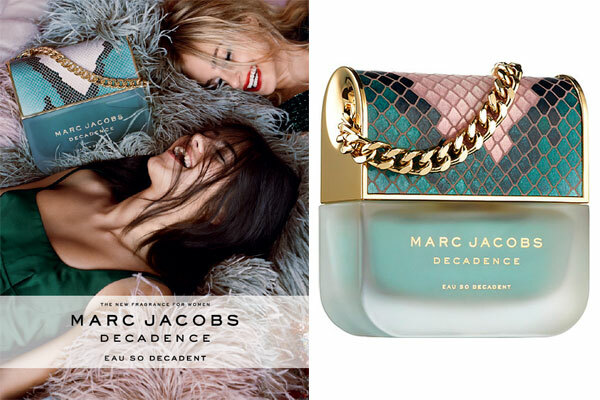 Decadence Eau So Decadent by Marc Jacobs - A new floral fragrance for women. This is a sheer floral version of the original Decadence perfume. The latest Marc Jacobs scent, created by perfumer Annie Buzantian, includes notes of pear, blackcurrant, lily of the valley, cashmere woods, and white amber. The original Decadence handbag shaped perfume bottle is updated with a frosted glass design. Launched in August 2017 this new fragrance is available in an eau de toilette spray from Sephora and Macy's. The ad campaign features models Kim Turnbull and Issy Boreman photographed by Alasdair McLellan. Package Design Original Decadence handbag inspired perfume bottle with frosted glass design.